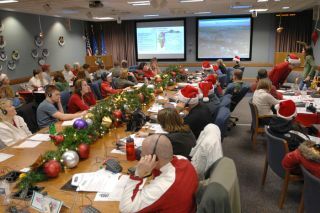 Volunteers at Peterson Air Force Base take calls from children wanting to know where Santa is. North American Aerospace Defense Command (NORAD) is a military organization that is shared between the United States and Canada. The group is tasked with looking for threats or activity in aerospace, which can include anything from looking for aircraft, spacecraft or missiles. As of 2006, a renewal of the agreement added maritime activities. The commander for NORAD is based at Peterson Air Force Base in Colorado and is expected to update both the U.S. president and the Canadian prime minister if required. NORAD's work is also split between three regions: Alaska (at Elmendorf Air Force Base), Canada (Winnipeg, Manitoba) and continental (Tyndall Air Force Base in Florida). In addition to its military work, NORAD is also known for tracking Santa every Christmas Eve. Around the same time that the United States and Russia were jockeying for positions in space, military concerns were changing the nature of defense back on Earth. When the Cold War began in the 1940s, Americans were concerned about the potential of long-range Soviet bombers, who may be able to cross an ocean without anyone in the United States knowing about it, according to NORAD. The United States created an Air Defense Command in 1948, and in 1954 decided to add the Navy and Army to it as well. Dubbed Continental Air Defense Command (CONAD), the organization implemented an advance warning system including radar, and came up with the plans to deploy troops should an invasion occur. Canada and the United States share a long border, so over time officials believed it made sense to share resources. This led to the creation of NORAD in 1958. Meanwhile, as the USSR improved its missile capabilities in the 1960s, NORAD took over an Air Force warning system to track the missiles worldwide by satellite. “Throughout the 1970s, the ballistic missile threat caused policy makers to reassess the effectiveness of the air defense system,” NORAD wrote. Some structural changes came to NORAD in the late 1970s, such as changing the A to represent "Aerospace" rather than "Air" in its acronym. This was intended to represent its mandate to track satellites and space launches around the world. Other structural changes included updating the early-warning system, and altering the command structure for ballistic missile warning and space surveillance. NORAD also participated in campaigns such as tracking drug traffickers in the 1980s, after the Cold War finished. While its mandate to look for airborne threats continued, its work altered after the terrorist attacks of Sept. 11, 2001, in New York City. It now does regular air patrols under the name Operation Noble Eagle. The organization has also had a few false alarms over the years. For example: on Nov. 9, 1979, according to History.com, NORAD officials received word that the Soviets were about to send missiles toward North America. After sending orders to interceptor aircraft and moving to protect the U.S. president, NORAD realized its mistake: a technician had accidentally loaded a training program for a Soviet attack. There were three unrelated computer problems for NORAD in the following year. For the past six decades, NORAD has also taken on a special non-military role – it tracks down the whereabouts of the jolly old man in red. It began Dec. 24, 1955, when the Continental Air Defense Command (CONAD) Operations Center in Colorado Springs, Colo., received a call from a young girl tracking down Santa Claus' whereabouts. Several other calls followed, the result of a misprint in a local newspaper advertisement. Colonel Harry Shoup, who was on duty, decided to take on the job and asked his colleagues to find where Santa was. CONAD continued the tradition every Christmas. When NORAD was created in 1958, the organization inherited the duty. To this day, on Christmas Eve, NORAD provides updates on social media, on a website and through the telephone so children know Santa's whereabouts.